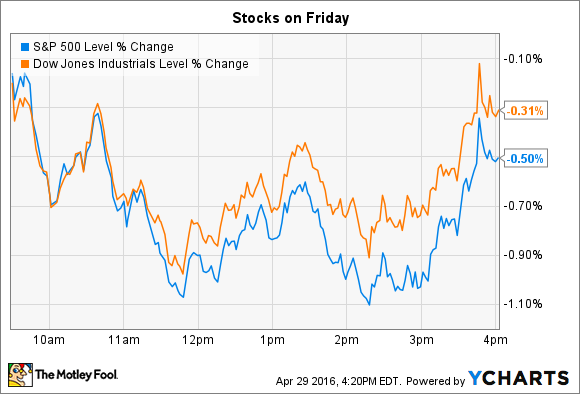 Why these two stocks rose even as broader indexes sank on Friday. Stocks flirted with significant declines on a few occasions during Friday's trading session, but ended with only minor losses. The Dow Jones Industrial Average (DJINDICES: ^DJI) shed 56 points, or 0.3%, and the S&P 500 (SNPINDEX: ^GSPC) lost 11 points, or 0.5%. Both indexes ended up with slight gains for the month of April. Dozens of companies posted first quarter earnings results on Friday that sent their shares soaring (or tanking). Among the biggest winners of the day were Amazon.com (NASDAQ:AMZN) and Monster Beverage (NASDAQ:MNST), which both impressed Wall Street with their Q1 numbers before the opening bell. Amazon shares gained 10% and have now returned 36% since February. The e-commerce titan announced surprisingly strong first-quarter results as its 28% sales jump was at the high end of management's guidance. The $1.1 billion of operating income it generated also blew away executives' forecast of just $400 million. Cash flow, which CEO Jeff Bezos and his team seek to maximize, doubled to $6.4 billion over the prior twelve months. Its cloud services division was a standout as operating income tripled to $600 million on a 62% spike in sales. The AWS segment is now a $10 billion annual business just a few years after beginning as a tiny side project. Still, Bezos chose to highlight the company's tech design successes, including its Echo and Fire product lines. "Amazon devices are the top selling products on Amazon," he said in the earnings press release. "We're building premium products at non-premium prices, and we're thrilled so many customers are responding to our approach." As strong as Q1 was, the company is guiding toward what might be an even better quarter. Sales are projected to grow by as much as 32% in Q2, and operating profit could again reach $1 billion -- if Amazon hits the high end of management's guidance . Energy drink specialist Monster Beverage spiked 13% higher after Q1 earnings results beat expectations. Sales growth clocked in at 16%, and surging profitability powered a 50% jump in net income to $166 million, or $0.79 per share up from $0.03 per share a year ago . Monster's global partnership with Coca-Cola (NYSE:KO) continued to open lucrative doors for the company, with markets in Australia and New Zealand next up on the distribution launch calendar. CEO Rodney Sacks said the agreement is also helping deepen Monster's access in the key U.S. market. "In the United States, the Coca-Cola bottlers have expanded the number of outlets in which Monster Energy drinks are available, and we are seeing improvements in our levels of distribution," he said in a press release. In concert with the earnings report, Monster announced plans to use a big chunk of its growing cash hoard to buy back its own stock. Management intends to purchase up to $2 billion of its shares in a Dutch Auction process in May, accounting for a significant portion of its $26 billion market capitalization. Investors cheered the news, which, together with the positive operating trends, points to solid per-share earnings gains ahead for this growing company.